Happy Comic Release Day! Welcome to another installment of GeekMom Comic Book Corner, where we recap our adventures in comics for the week as well give you some of the latest in comic book news. The conclusion to Avengers vs. X-Men mini-series (writer: Jason Aaron, pencils: Adam Kubert, inks:John Dell, Adam Kubert, Mark Morales) has finally arrived and I don’t think I could have hoped for more from this final issue. The writers did a great job going back and explaining a few things that were left out in other rounds and the artists did an amazing job showing the details of the final fight between two of the biggest teams in the Marvel universe. This is the first mini-series I’ve read and it has me wanting more of both teams. A few of the characters surprised me in this issue, but none more than Tony Stark with his discovery of faith. Tony has been about science and facts since the beginning (even going as far as creating a computer to use Wanda’s mind and powers to search out every possible ending to the final battle), but it appears his stay at K’un L’un has changed him. He now believes that Hope and Scarlet Witch are like Yin and Yang and when the final battle comes, together they will balance each other out and together, defeat the Phoenix force. In short…the Avengers won, thanks to Nova showing up to bring Cyclops back down to Earth and Hope and the Scarlet Witch hitting him with everything they had. I was happy to see that even with all the fire and fighting going on around the characters, the creative team found time in a couple of panels for a touching moment between Jean Grey’s spirit and Cyclops. After Cyclops was beaten, the Phoenix power finally took over Hope and with the help of Scarlet Witch, realized her true destiny in regards to the Phoenix force. The moments that Scarlet and Hope share after Hope takes on the Phoenix power are some of my favorites in this issue. Marvel did an awesome job taking the story full circle and figuring out a believable way for Hope and the Scarlet Witch to handle the Phoenix power and undo the damage from the events leading up to the fight between the Avengers and the X-Men. The battle may be over, but the recovery from the events is is far from it. 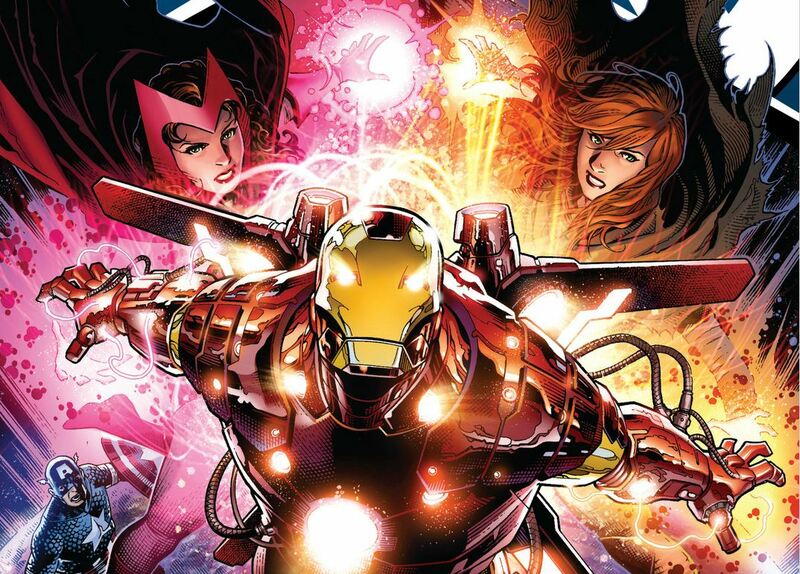 The events of AVX will have consequences, which is where the next five-part mini-series, Avengers vs. X-Men: Consequences comes in. The first issue is released today and focuses on the rebuilding of Wakanda and the aftermath of Namor’s actions. Avengers vs. X-Men the graphic novel is up for pre-order on Amazon and includes the entire mini-series as well as the AVX Story – Point One , AVX: VS 1-6 (a series about the individual fights behind the scenes of the major battles) and Avengers vs. X-Men: Infinite issues 1, 6 and 10. Last month was my wedding anniversary and one of the presents my husband bought was a signed copy of Why The Lone Gunmen Were Cancelled , an independent one shot comic written by Dean Haglund who played Langley on The X-Files . The comic tells the story of how The Lone Gunmen’s spin off show came to be and also how it came to end, with some of the crazy stuff that went on between. It’s haphazard, fun and occasionally NSFW – especially on the last page – but it’s also clearly a comic that comes from the heart. This is a true story written and drawn by a man wanting to say his piece and that really comes across. If you’re interested in The X-Files or in behind the scenes looks at the TV industry then I recommend that you pick yourself up one of the remaining copies. Dean is also working on a new comic about an Iraq war conspiracy due in 2013 following a successful Kickstarter campaign; you can read more about it on his website or follow him on Twitter and Facebook. Issue five of Assimilation2 continues the Doctor’s desperate attempts to convince Captain Jean Luc Picard to change his mind about contacting the Borg. So far the series has been mostly set on the Enterprise with the TARDIS crew getting to know all about the ship, this time the roles reverse as Captain Picard takes his first flight aboard the TARDIS and visits the home planets of many different races from both shows. This issue is much slower than the previous few but succeeds in setting up the necessary change in direction following events in issue four. Looking to find out more about the great heroines of the DC universe? Then check out the DCWomenKickingAss DC Women Tournament. Last year’s contest ended in a battle between Wonder Woman and Oracle that was won by Oracle. (As the winner isn’t determined just by power but also by the awesomeness of the character.) It’s a great way to read about all the female characters in the DC Universe and the comments, especially in the finals, are fun to read as posters wax poetic about their favorites.